This is not the first time Stephen Harper has demonstrated perfect clarity when it comes to the fanatic Islam's threat on the entire free world. While others are whitewashing and bending over backwards to make sure they stay politically correct, Harper tells it like it is and appears to be one of the only sane leaders left in the world. 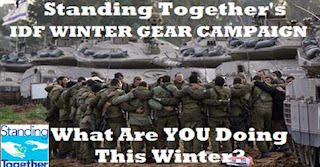 The Israel Shield / Standing TogetherWINTER GEAR CAMPAIGN FOR IDF SOLDIERS! It's freezing outside and we are raising money to supply thousands of IDF soldiers with winter gear packs. We have already delivered thousands of packs and we are constantly getting phone calls from soldiers. Here is your chance to show your support for Israel and the IDF!